Don’t Forget – Only a Day Away! The Sheffield Wellbeing Festival is back and better than ever! This year on Friday 26th July we’ll be filling Fargate with stalls, activities, games and even a film screening. Two months ahead of World Mental Health Day we will bring together organisations and charities from across the city in a celebration of wellbeing and the wonderful range of services those very organisations offer people experiencing mental health problems and their carers. We’ll also be promoting the steps we can all take to enhance and safeguard our own mental health and wellbeing – just as important as getting your 5-a-day. One in four of us will experience a mental health problem at some point and so the services that support people in those times are vitally important, however all too often these services are unsung so it’s time to sing loud! The festival will see Fargate brimming with stalls from organisations offering information on their services, volunteering opportunities and much, much more. From 11am we’ll also be offering free taster sessions for fun, healthy activities that the whole family can enjoy from Zumba to parachute games, as well as stilt walkers and a free facepainter for the young, and young at heart. For the first time we’ll also be joined by Sheffield City Council’s Little Library which will be offering children’s activities and workshops throughout the day. As if all that isn’t enough, there will also be music, children’s workshops, and much more, so what are you waiting for? Get that date in the diary. Sheffield Mental Health Week 2012! Hope you’re as excited as we are – here’s all the info you need to get involved. Hillsborough Park, meeting at the car park on Parkside Rd. Join us and the Lord Mayor for a ceremonial tree planting to officially open the week. Powerleague Stadium, Woodburn Rd, S9 3HL. Football tournament open to all mental health service users. Pakistan Advice & Community Association, 127 Page Hall Rd, S4 8GU. A day celebrating positive mental health through activities promoting self-help strategies to help you relax and recharge. Hallam University Students Union, the Hubs, Paternoster Row. Awareness raising event with stalls and activities. Argyll House, 9 Williamson Road, Nether Edge S11 9AR. Launch event for this new project at Argyll house. The Circle Building, Rockingham St, City Centre. An exhibition of art from self-help groups and other survivor artists featuring impromptu performances by mental health survivor poets, brought to you by Sheffield SHIP in partnership with SUST. There is such a thing as a free lunch and games will range from dominoes to pool with a special guest giving out the prizes for the close. Exhibition of art produced by service users and also featuring music and poetry. Speakers, discussion groups as well as free sessions of Indian head massage, yoga and foot massage. Free sessions including laughter yoga, positive affirmations, emotional freedom technique and much more. Celebrate and laugh with us as we draw the week to a close with a special performance from Edinburgh fringe festival 5-star performer Peter Antoniou and surprise guests! Awareness raising event with stakeholders running stalls to promote their activities. The Healing Word’s Feel-good CD will be launched at this celebratory event. Sheffield Mental Health Week 2011! 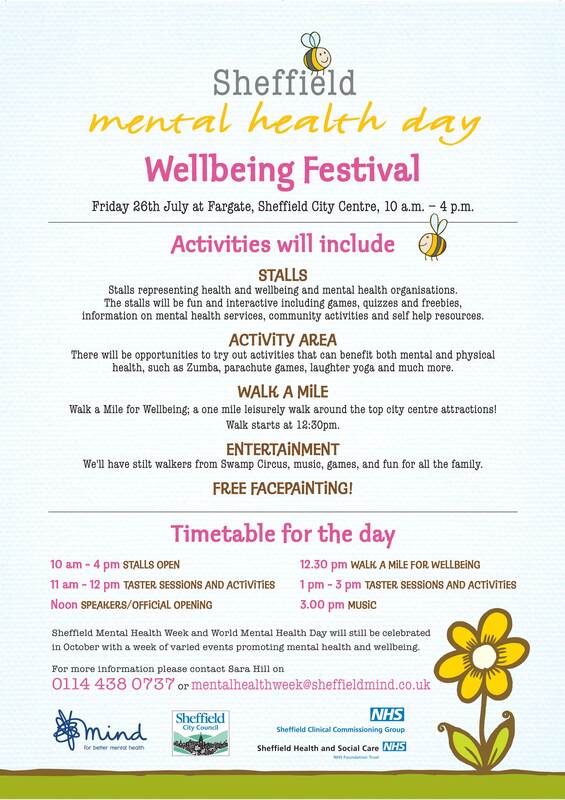 Following the success of our Wellbeing Festival of 29th July, we are excited to be approaching Sheffield Mental Health Week, 2011. The Week aims to promote positive mental health for all and to celebrate and promote the excellent services that exist in Sheffield and the people who use them. This includes raising awareness of mental health issues, challenging stigma and discrimination, providing access to information, providing a signpost to services and engaging with a wide variety of community and charity organisations. We’ll be bringing you a full and varied programme of events, each of which is open to the public and free to attend. Beginning with an exhibition of art created by service users within Sheffield Health and Social Care; ‘Touching the Soul’ will be open to the public from 11am to 4pm on the 8th and 9th of October at the Jessop West exhibition space. A collaborative event, it has been curated by C.A.S.T., is hosted by the University of Sheffield and also sees the launch of a board game developed by the young people’s group at the Right Here project. Arts displayed will range from images, to poetry, music and sculpture. Our official opening will be marked by our first tree planting ceremony. Beginning at noon on World Mental Health Day (10th October) we will meet in the brand new amphitheatre in South Street Park for planting of a gingko biloba tree. The tree is being kindly donated by Sheffield City Council and is colloquially known as the ‘bearer of hope’, so it could not be more appropriate. We are also pleased to welcome the Deputy Lord Mayor to the ceremony. Wednesday 12th will see the reprise of one of last year’s most popular events; Pies, Peas and Games afternoon at the St. Wilfrid’s Centre. Head over to 524 Queens Rd at 12:30pm and sign up for the games which take your fancy. Games included are dominoes, triominoes, darts and pool and prizes will be presented by a secret celebrity guest! We’ll be rounding the week off with good old-fashioned chuckle at our official closing party ‘Cabaret Fantastiques’ on Friday 14th at the Riverside Bar on Mowbray St, from 7:30pm. Fresh from a 5-star reviewed show at the Edinburgh Festival, Peter Antoniou is our headline act for the evening and he will be joined by special guests for an evening of mirth and merriment, mind-reading and music. Keep up to date with us on twitter @SheffieldMHW, facebook or call Sara Hill on 0114 2216174 for more information. On 29th July Fargate was populated by stalls, stiltwalkers, zumba, music and merriment for Sheffield’s Wellbeing Festival and festive it certainly was. Forty different organisations from across the city took part in the day to promote their services, engage with the public and bring awareness of mental health issues to the fore. The event is a collaboration between NHS Sheffield, Sheffield Health and Social Care NHS Foundation Trust, Sheffield City Council, Sheffield Teaching Hospital NHS Foundation Trust and Sheffield Mind and provides a platform for these and smaller organisations and charities to showcase their work. This years event was as resounding success with organisations reporting over 100 direct interactions with the public. With face painting for the kids, poetry from Matt Black and music from Mark Nichols as well as interactive taster sessions throughout the day; there was something for everyone. It doesn’t end there. In October officially beginning on World Mental Health Day, 10th October, we will present a programme of awareness raising events which will continue to deliver the positive steps message. These are simple steps that each and every one of us can take to help maintain our mental health and wellbeing which are just as important as eating your 5-a-day. > Do things you enjoy: Make time for yourself and do something you enjoy. Perhaps something creative like music or drawing? > Take regular exercise: Regular exercise really helps to reduce feelings of depression and anxiety and can give you more energy. > Make time to relax: Try to make time for yourself and do something that helps you unwind like reading, music, meditation or prayer. > Spend time talking: Keep in touch with friends. It is important to spend time with other people. > Learn new skills: It can be fun, will help you to meet new people, and can boost your confidence. > Be yourself: No one is perfect! We all make mistakes so don’t be too hard on yourself. Accept who you are. Our friends at Get Walking, Keep Walking are organising a fabulous event as part of the Wellbeing Festival on Fargate, 29th July. The Walk a Mile for Wellbeing will set off at 1:30pm from the top of Fargate (near Next) and any and all are welcome to join in! Participants will receive a free step counter and be entered into a prize draw for lots of walking goodies – as if that wasn’t enough the first 50 people to register will also get a free water bottle! Have a gander at their website and the flyer for more details and we’ll see you there! We just wanted to say a quick thank you to Your Voice and Now Then magazine for featuring our event! It’s wonderful to get the support. You can see our feature in Your Voice in these lovely scanned pics – including an inset of some simple positive steps for feeling good which we think are just as important as eating your five fruit and veg a day. You can read the feature in Now Then magazine’s July edition here – we’re in the Favourites section! Keep up with us on Facebook / Twitter too and tell us what you think of the event as we’d love to hear your views.